You may have heard of a fat tire bikes in the past (also known as a fat bike or snow bike), since they’ve been around since the early 1900s. But it’s only in the past few years that fat tire bikes have started to become popular with the mainstream riding culture. WHAT’S THE BIG (FAT) DEAL? A fat tire bike is versatile and can help you ride lots of different types of terrain. Yeah, fat tire bikes are great in the snow—but they’re also fantastic on just about any trail (which means year-round biking is possible, even if you’re not here in Southern California). Many people ask if fat bikes handle like mountain bikes, and the answer is…sorta. Fat bikes used to handle differently than normal mountain bikes, but newer models have been built to handle much closer to traditional mountain bikes. For all intents and purposes, modern day fat bikes are simply mountain bikes with bigger tires. As with every other bike style, fat bike frames come in lots of different materials, such as aluminum, carbon, titanium, bamboo, and steel. With any bike purchase, be it fat bike or otherwise, you’ll want to go into the process knowing what type of riding you plan to do, and what kind of budget you’ve got. 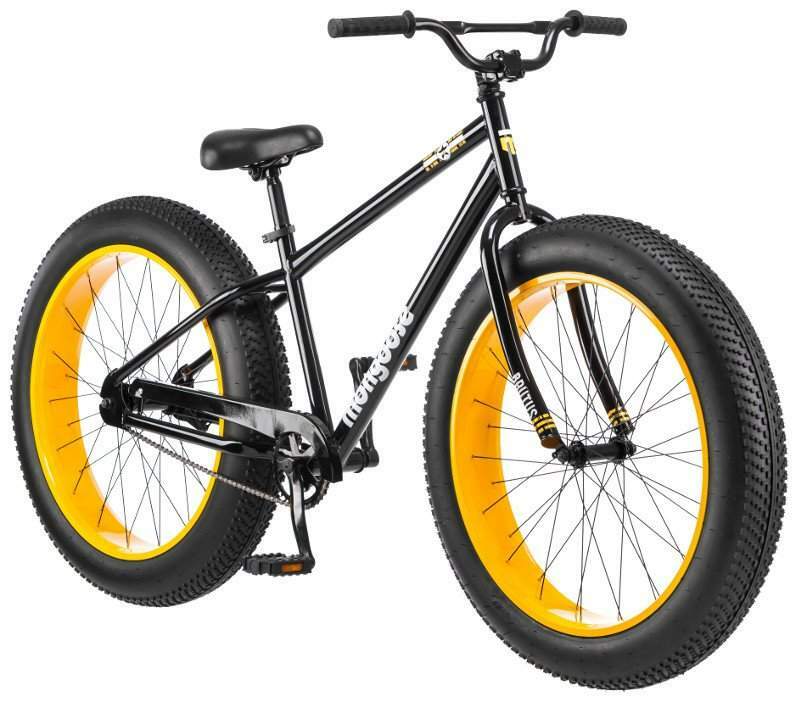 The “fat” in “fat tire bike” obviously comes from the wider tires that provide more traction in both dirt and snow. These bikes climb uphill like no other bike can (except maybe an electric bike). Wider tires equals low pressure—typically under 10psi (traction! floatation!). For even better traction, you can even pick up some studded tires! Being a Los Angeles-based bike shop means we have options when it comes to weather. We can drive to the snow when we want to experience it, or stay home and enjoy consistently good weather. But whether you are riding your fat tire bike in the snow or on dirt, it’s a whole new big fat feel! If you want to learn more about the best fat tire bikes, contact us at Bike Shop LA—or better yet, come in for a test ride on a Momentum iRide Rocker!